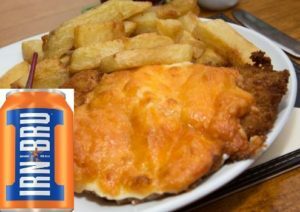 We’ve already covered the obesity crisis in the North East of England 1 , but I couldn’t resist sharing an article with you which just appeared in i News, entitled “The problem with the nation’s health isn’t the parmo – it’s what it represents.” 2 . 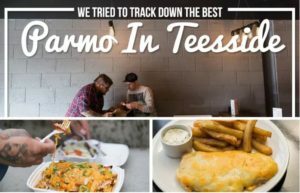 If you don’t come from Teesside, you’re unlikely to know what a parmo is. 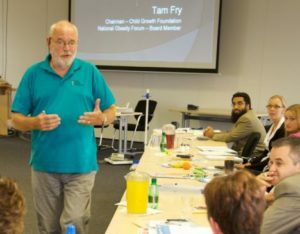 It’s something that appears to be quite unique to this area – certainly in terms of its established popularity as part of an utterly unbalanced diet. It consists of either a breaded chicken or pork escalope, deep fried and topped with a bechamel sauce and some form of greasy high-fat cheese (Parmesan or Cheddar usually). They come in at around 2,000 calories a serving (more than most non-athletic adults should consume in a whole day) and are usually accompanied with a massive pile of fried chips (French fries to those outside of the UK) and a can of Coke or Irn Brew, being that we’re “up North”. 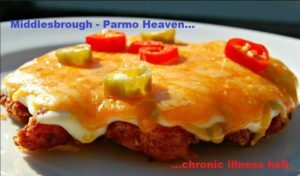 The parmo was apparently brought to the Boro over 70 years ago by some American soldier after WWII. 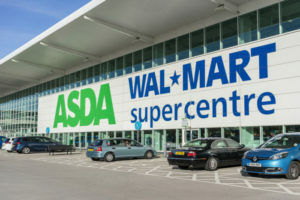 The Asda chain, owned now by Wal Mart, has a store in Stockton, next to Middlesbrough. It’s the only one of there 600+ UK stores to stock the parmo. Any coincidence that life expectancy in the poorer parts of Teesside are as low as 47 years of age – 18 years less than in more affluent areas 3 4 ? Tees Valley, which includes Middlesbrough, has a mayor called Ben Houchen. Believe it or not, he’s been campaigning 5 to get the parmo a Protected Designation of Origin Status from the EU, the same as Champagne, Melton Mowbray pork pies and Cheddar cheese have. Another report, just released by the NHS 7 , pointed out that 10-year-old children in the North-East were ranked as the most unhealthy in Britain. 23 percent of them are classified as obese. Pretty shocking figures, but I’m actually surprised it’s such a low figure when I see children in the town centre. There are some (e.g. Dr Joel Fuhrman 8 ) who argue that the classification of obesity should be lowered from a BMI above 25 to above 23. This is because of the changes in health status once BMI passes 23. 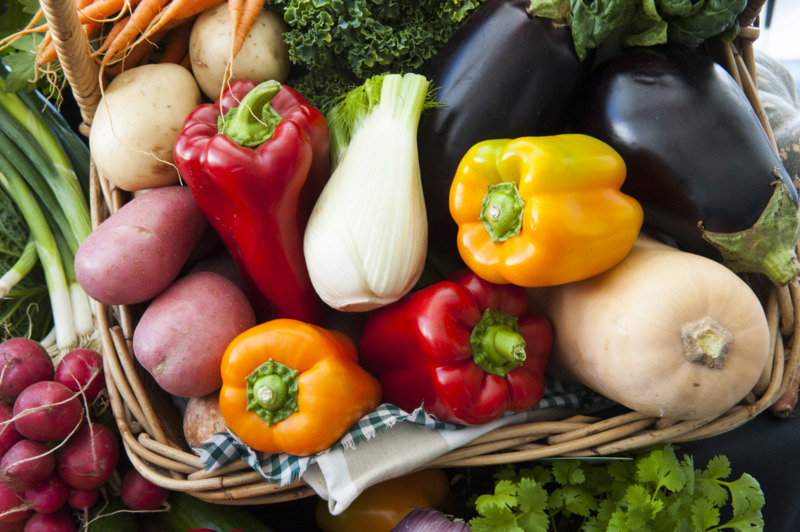 You can usually tell whether or not a person eats a WFPB diet from looking at their belly! The ideal answer to the health problems caused by artery-clogging frankenfoods like parmos is so simple and yet so difficult for most people to consider possible – eat non-processed plant foods. It’s as simple as that. Of course, neither local government in the areas affected nor national government are likely to start suggesting anything so extreme as eating the optimal diet for human health; but at least they can ensure that the NHS and doctors surgeries can get more funding so that they can cut more people open to repair their ravished bodies and stuff them with more pills to reduce some of their unnecessary suffering and pain. An interesting point raised by the iNews article is that people in the poorer parts of mainland Europe have tended to eat more healthy, locally produced food as a necessity, and not a luxury. However, “In Britain, unfortunately, it’s something of a race to the bottom: load it up and sell it cheap. The parmo is not the problem in itself. It is more the symbol of a careless attitude to nutrition that extends way beyond the North-East.” Can’t argue with that.